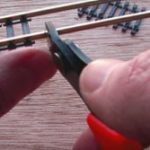 Hornby and Peco track is cheap and compatible with a huge number of trains but it has a problem. As mentioned in this post on my shed layout, normal OO gauge track doesn’t have the correct proportions — compared to the real thing — and to an observer can look artificial. For my shed layout, I’ve opted to us EM gauge. On this track, the rails are further apart (the gauge) and spacing between sleepers is wider. This gives track that is much closer to how it should be for the scale and it looks much more realistic. But changing the gauge also means the wheels on the rolling stock need adapting. 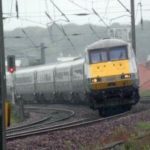 For carriages and wagons this is relatively straightforward but for locomotives, fitting the replacements is more problematic. And for both, it’s expensive. Replacing all the wheels/axels on all your rolling stock quickly mounts up! While building the £35 model railway challenge, I’ve been experimenting with a technique to improve the look of the OO gauge track without needing to modifying the rolling stock. This is to change the spacing of the sleepers. The rails remain the same distance apart (gauge) but I’ve increased the sleeper spacing. The test result can be seen here in the photo below. The track section on the left is normal OO gauge. On the right, I’ve adjusted the spacing between the sleepers of some Peco track. Some people argue it still looks artificial as the gauge is wrong but, personally, I think it’s a good compromise between look and effort/cost and a big improvement compared to normal off-the-shelf OO gauge. Others agree although the consensus is that this is only worth doing on straights and curves, points are left alone. Another fan of the technique is William Green, of 3D printing service Shapeways. He uses it with impressive results on the Shedly Yard layout. You can see this in the picture above, at the start of this article, what do you think? To change the sleeper spacing is quite simple but fiddly. Turn the track over and cut the webbing between the sleepers (I still need to clean up the rogue bits of webbing in the photo above). This allows them to be moved up and down the rails. The webbing can be removed with a shape knife although I’ve been using these track cutters (via Amazon). To get the right the spacing, I cut a piece of wood to a length of 7mm (which if my calculations are right is approximately the correct distance for the scale) and placed it between the sleepers, moving them until they braced the wood. (The Double O Gauge Association (DOGA) is working on a jig for this, thanks to Phil Parker for the heads up on this). When I’m happy with the spacing I then apply a dab of Superglue to hold the sleepers in place. Another benefit of doing this is that with the inter-sleeper webbing removed, ballasting sits under the rails but the occasional gap is visible between the ballast and rail which further improves the look. Like William and his Shedly Yard, I’m very happy with the look and will be modifying all the track on my £35 railway project accordingly. Depending on how I get on I might even consider revising the plan to go EM gauge for my shed layout but we’ll see. This and painting the sleepers a wood colour — instead of the awful black that Hornby and Peco use by default — is also worth doing but that’s another article. Do you think this revised sleeper spacing looks better? Will you be doing it? Do you already do this? Please let me know in a comment below, I’d really like to know. Footnote: Normal disclaimers apply. I strongly recommend you try this out on some spare track first and don’t do it unless you’re prepared to potentially ruin your track. Picture credit: Shedly Yard photo reproduced by kind permission of William Green. Follow Shedly Yard on Twitter here.